It’s a month after Christmas and you’ve got a birthday or other celebration coming up for which you need to buy a gift. What do you get a child who already got everything they wanted for Christmas? How about a Mail Order Mystery? My girls and I received one for review purposes and we had a ton of fun with it. Mail Order Mysteries make the perfect, unique, after Christmas gift that also keeps giving! So what is a Mail Order Mystery? 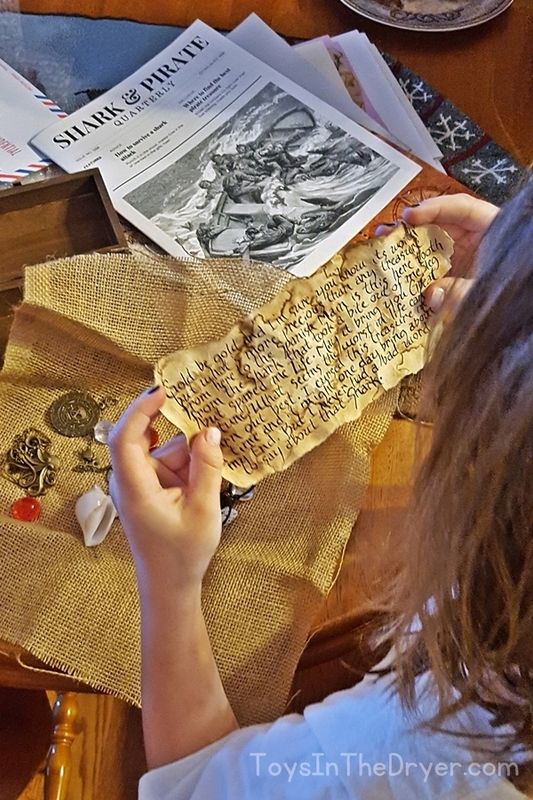 It is a mysterious story for children that unfolds through letters and items that come in the mail. The story is not told in a traditional way, but rather through a series of events. 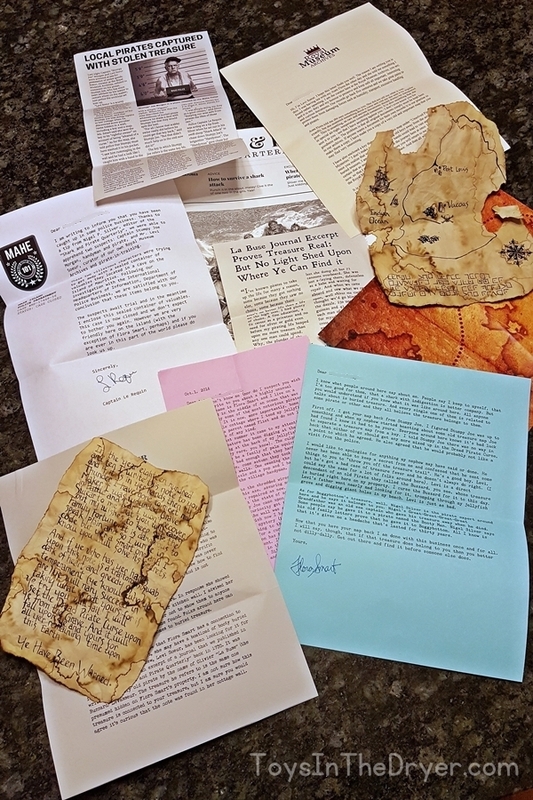 Depending on the mystery, you could receive hand-written letters, top secret folders, newspaper clippings, postcards, maps, keys, lockets and more. Each mailing contains something to do (a code to crack, a puzzle to solve, a number to call) in addition to the artifacts. All is revealed in the final mailing, a grand finale that contains a “payoff” keepsake or treasure related to the mystery. Treasure Hunt – Maps, keys, curses and sharks. Hidden treasure and scheming pirates. It’s up to you to find the family fortune, but can you keep it safe from double-crossing pirates? The Enchanted Slumber – A Knight, a Troll, a Librarian and a Dragon need your help to wake a princess who has been asleep for 699 years. In this twisting, turning take on an old fairy tale, nothing is as it seems. Spies, Lies, and Serious Bad Guys – We need your help to find a missing agent. Solve the ciphers, enter the codes and stop the evil villain before it’s too late. According to the Mail Order Mystery website, all mysteries are geared toward both boys and girls and are best for ages 8-13. However, after reviewing the Treasure Hunt, I’d say it was best for ages 6-10. I agree that it can be for both boys and girls. Your first mailing will be shipped on the day you specify. After that, you’ll receive something approximately once a week for the next 5 weeks (total of six shipments). International orders (outside of the US and Canada) will receive their shipments approximately every other week. 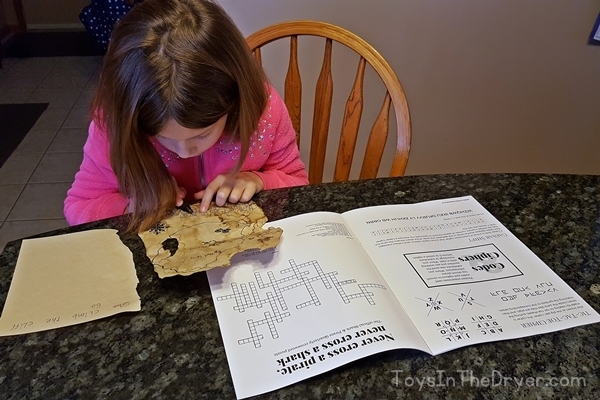 What did my girls and I think of Treasure Hunt? In a nutshell, it was a lot of fun. The girls were a bit confused by the first items that came in the mail as I did not warn them that the mystery was coming. I tried to play it off like I didn’t know what it was either, but they were too smart for that. Kiki (my 10 year old) quickly figured out that I set it up and it had something to do with my blog. After I explained what Mail Order Mystery was, they couldn’t wait for the next clues to come in the mail! Every week they came home from school asking if the new package had arrived yet. The actual items that came in the mail were as authentic as they could be for the cost and type of product that Mail Order Mystery is. The letters got a bit long and were full of non-important information so my daughters would start to lose interest half-way through them. That didn’t seem to have a huge effect on the fun or ability to solve things though. Each time a new package arrived, we did need to review previous mailings in order to figure out what is going on. Kiki wasn’t as impressed with the final “pay-off” treasure as TJ (my 8 year old) was. Kiki said, “it’s not a real treasure”. TJ didn’t care, “it’s awesome anyway! Can I take it to school to show everyone?”. I will say though, Kiki quickly claimed the shark tooth necklace as hers! Both the girls loved solving the pirate codes and fought over who got to do which line. All said and done, my girls really liked Mail Order Mystery and were sad to see it end. I think it would be fun to try the other two mysteries! You can give the gift of Mail Order Mystery to a child in your life by visiting their website. Have more questions? Visit their FAQ page.